When it comes to attracting skilled workers, branding can serve as an effective recruitment method. In fact, according to polling from Glassdoor, job candidates are 40 percent more likely to apply for a job when they recognize a brand. However, to build a truly winning brand — the kind that candidates don’t just notice but want to join — you need more than mere name recognition. You need to portray the culture that wins candidates over as soon as they walk through your doors. Make no mistake about it — potential hires begin diligently assessing business brands upon their very first interview. Actually, company brand assessment takes place even before that. 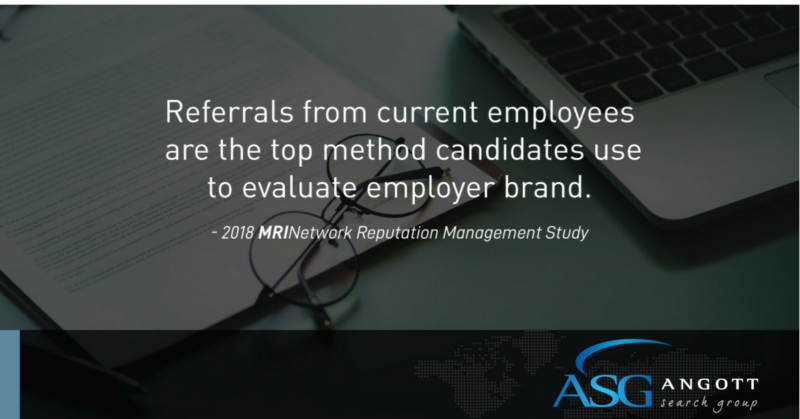 Indeed, based on the most recent Reputation Management Study conducted by MRINetwork, referrals from current employees are the most important element to evaluating a business’ brand, candidates say. Yet, it’s the job interview itself that provides candidates with the bird’s eye view they’re looking to capture. Sixty-four percent of candidates believe the interview provides them with a fair amount or a lot of contextual insight into a company’s culture, the study also found. Whether they’re created or born, leaders are the type of people that individuals are naturally drawn to, because they project confidence, reassurance and an understanding that everything will be alright even in stressful situations. Indeed, as Entrepreneur magazine reported from an Employer Branding International poll, leadership is one of the main pillars professionals view as an effective way for developing a robust employer brand. Making leaders the face of your company can go a long way toward establishing the winning brand potential candidates seek. Leaders can also gather ideas from workers on how to build a stronger employer brand, by asking what is most important to them, or what they feel the company may be lacking, like programs that foster a healthy work-life balance. As the Reputation Management Study found, applicants use online job search engines to learn more about employers’ brand message. The interview itself, however, serves as a more reliable barometer for them because applicants are now face-to-face with you and your colleagues. You never get a second chance to make a good first impression, so the interview is where you should let your light shine, so to speak. By referencing the company’s various policies and programs that support the staff — like maternity leave, career pathing, performance perks and employee benefits — candidates can get a sense of the business’ culture in ways that they couldn’t on their own. It’s the information era and candidates have many avenues to size up employer brands. Knowing the platforms applicants use most can enable your company to better focus its efforts in showcasing the organizations strengths. According to the Reputation Management Survey, nearly 60 percent of candidates said employee referrals were their preferred method, followed by the company’s website (56 percent), third–party company review sites like Glassdoor (38 percent), employee testimonials (28 percent) and media coverage (24 percent) rounded out the top five. By relying on your existing strengths and knowing the message you most want to portray, your employer brand can be a magnetic force, attracting the candidates who make your company great.